Migrating from one tool to another can be quite a task. 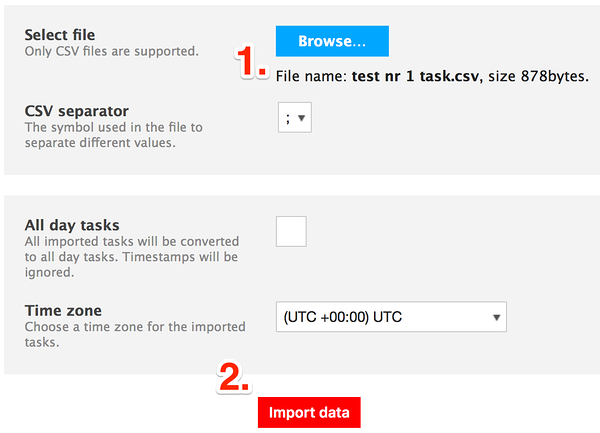 To make it a bit easier for you, import resources, projects, tasks, and custom data fields from a CSV file. You can import all of them together or each one separately. First, you need to select what you want to import. Then, simply download the template CSV file and fill it out. To import tasks, you must have at least one resource. If a project or a resource already exists in Ganttic with the title you enter to the import, the data will be overwritten. I.E. the data in Ganttic will be replaced with the data from the import. However, that rule does not apply to tasks. If you import a task with a title that already exists in Ganttic, a new task with the same title will simply be added to your timeline. The first row of each column is the row you really need to pay attention to. That's the row that will determine the type of the data that is being imported. You can enter the data to the columns in a random order since the columns are defined by the first row. You can use "," as well as ";" to separate the columns. All the column titles are case-sensitive, including custom data fields’ titles. If there isn’t a match for the column title, the import is aborted. The data that you enter can be in quotes. This will open the import section. Select 'Resources', 'Tasks' or 'Projects' from 'Build a template' section on the right. The selection depends on what you need to import. A template with the options you have chosen will be downloaded to your computer. Open the template CSV and fill it with your data. After you have done it, make sure to save it as a CSV file. If you want to import custom data fields and associated values then make sure the fields are created in Ganttic first. Otherwise, data fields' titles/headers will not show up in the template CSV file. 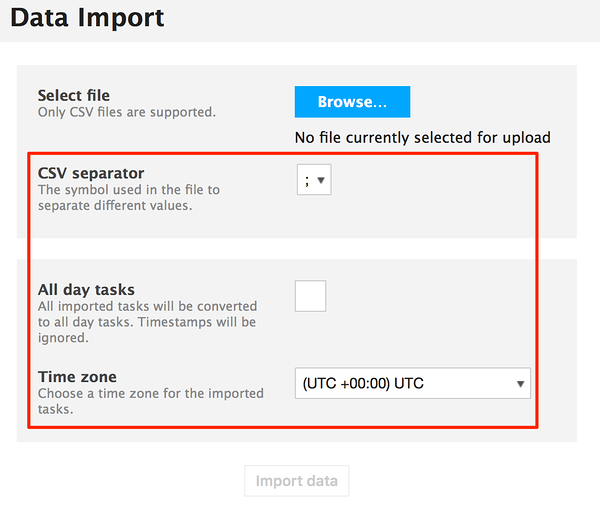 If you're done filling in your data, save the file in CSV format (with UTF-8 character encoding) and go back to Ganttic's 'Data import' interface. The symbol used to separate different values. It's needed if you want to convert your tasks into full-day ones. It's needed if the tasks about to be imported are scheduled for another time zone. Make sure it's filled in correctly since the import won't start otherwise. If you followed the instructions, your data will be imported. To import resources, you must have a column with resource titles. The column must be titled with Res_Title_N. You can add custom data fields to resources using the column title Res_N_Data(Title of the custom data field). 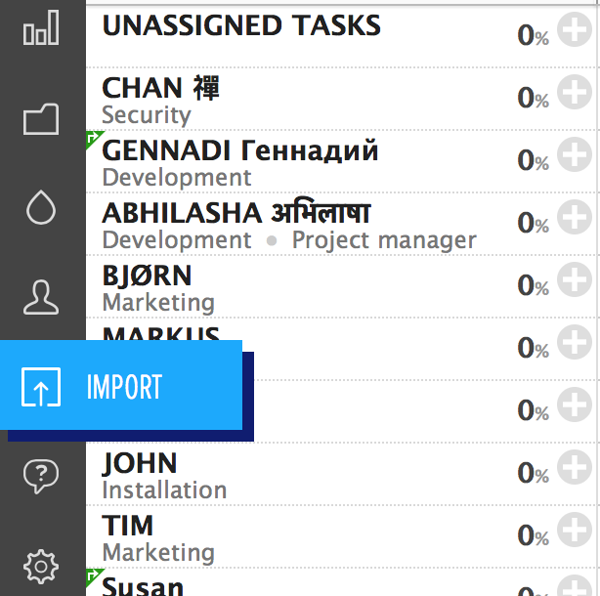 To import projects, you must have a column with project titles. The column must be titled with Project_Title. As it was with resources, you can add custom data fields to projects using the column title Proj_Data(Title of the custom data field). To import tasks, you must have a column for the start and end date and time of the tasks (Task_Start_Date_Time; Task_End_Date_Time). You can but don't have to add a title column (Task_Title) or columns for custom data fields [Task_Data(Title of the custom data field)]. Also, it's not needed to have specific task times. You can use dates only but in this case times have to be marked as 00:00. To import tasks with predefined load/utilization %, it is needed to add a column with the title Task_Util. Then simply add the percentage number/load (without the % symbol) to each task's Task_Util section. Mandatory column titles: Task_Start_Date_Time; Task_End_Date_Time. The mandatory date and time format is yyyy-MM-dd HH:mm. If the start and/or finish time of the task is not given with 15-minute accuracy it will be rounded up. If you have all-day tasks and tasks that are not all-day tasks, import them separately. 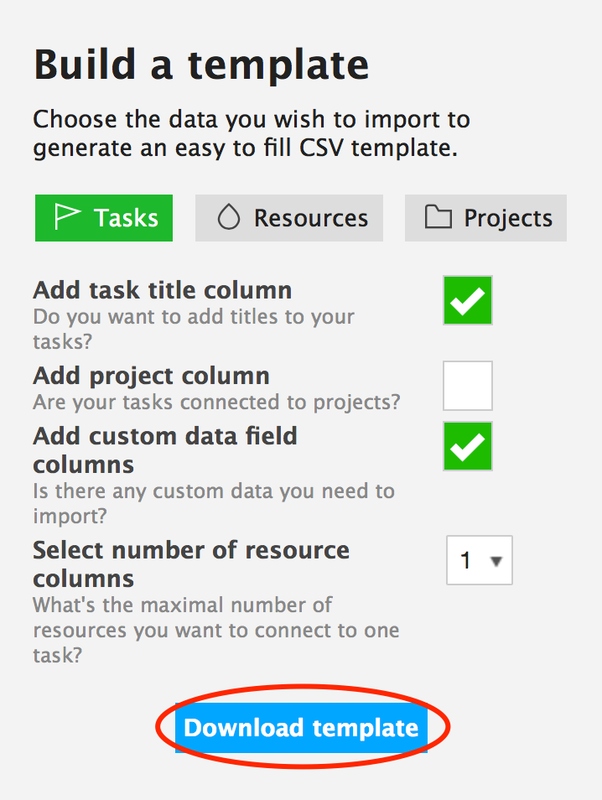 When importing custom data fields, you must assign a resource, a project, or a task to it. You can only add values to custom data fields with the import function. You must create the actual custom data fields in Ganttic beforehand. You can’t import LINK or USER type of custom data fields. Did not find the answer to your question regarding data import ?